'Pebbles' is the guest cottage on a 7 acre estate, enjoying total privacy. Wonderful views looking north up the coast of Eleuthera and out to sea. The beach is miles long and offers all sorts of different places to swim. Amenities: One bedroom with King size bed and a/c, two bathrooms, one with a washing machine. Pull out queen size sofa bed in Living/dining area, with VCR and CD player. A/C throughout. High speed WIFI Internet. Pebbles had new doors and windows installed in March of 2016. The kitchen is fully equipped with cooker, microwave, dishwasher, coffee maker and all necessary cooking utensils. A telephone for incoming and local calls. All rooms have magnificent ocean views! Maid service, baby sitting and private cook are available by special arrangement. My family have been involved on Eleuthera since the late 1930's. I love this island and it's friendly people! If you are looking for a chance to relax, away from the madding crowd...listen to the waves, walk along a virtually deserted pink sand beach, going on for miles...dine under a canopy of stars...then this is what you will find at 'Pebbles'! Excellently well decorated and fully equipped! Right on the beach...with stunning views! Everyday is slightly different, depending on the ocean! The main bathroom has 2 sinks and 2 shower units. There is an outside shower for rinsing off when you come from the beach. The second full bathroom, just off the living area also has a tub and shower, sink and toilet. The location, view, beach and access, privacy and cleanliness of the property were everything we hoped for. We had a wonderful, relaxing, rejuvenating stay. This is the best experience Eleuthera offers except for the friendliness of the Eleutherans (or if you are a bonefisherman). I recommend that the owners install a water processing system to remove the smell of hydrogen sulfide from the tap/shower water. It's not a showstopper but detracts from the otherwise wonderful experience of staying in Pebbles. This pretty much explains 4 instead of 5 stars for property condition. Great spot, owner is very friendly, kind and helpful. Beach is amazing. On the downside, the house needs a little bit of love and not as clean as I would expected. Pebbles Cottage has the advantage of being situated in the middle of the island and right on the Atlantic shores. Close to a few reputable eateries (such as Tippy's and our fav Fine Foods) and places like the Leon's Preservation). It only takes a few hours to get to a northern island destination (such as Preacher's Caves or our fav Queen's Bath) and the same time to a southern destination (such as Lighthouse Beach or the Marina). Cottage was clean and well-maintained; it looked just as the photos suggest. Yes, the tap water does not smell great as mentioned in other reviews but that's to be expected with sulfur in water (commonly found in well water). The few issues we had during our stay were out of the ordinary: the microwave failed but the owner and housekeeper had a mechanic inspect then replace it within a day. The few things that were out of stock (such as toilet paper) we could have easily requested or picked up at a store. We would have enjoyed a DVD player that worked for the late evenings. Owner is friendly and helpful. Beach was beautiful and semi-private; only flaw was the washed up garbage against the coastal line of the beach (actually all over Eleuthera). Pebbles had a new housekeeper and she was very kind and helpful though hard to get in touch with. The bed at Pebbles was comfortable - a bonus! You could open the patio door in the room and listen to ocean waves all day and night. Neighbors were hardly seen or heard. Only thing that was confusing was the reservation end of things through VRBO and finding the cottage in the first place. We were told how to get to "On the Rocks" but on arrival still drove past it 3 times - so did a local man who came to repair our rental flat tire. Fav activities was hiking the preserve, visiting Queen's Bath, snorkeling. 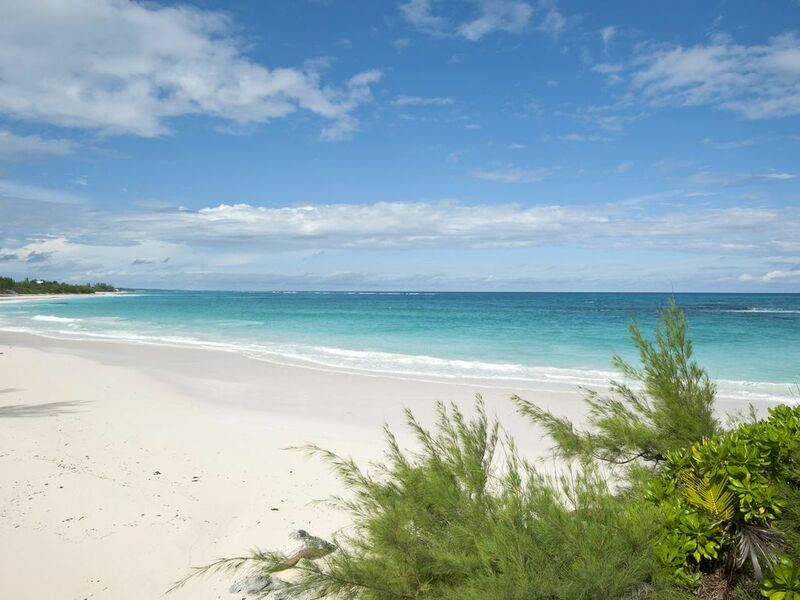 Check out Eleuthera Tours - great service! Make sure to rent a 4x4 for beach hunting and save up for the grocery costs or better yet, bring your own food - though Rum is cheap!!!! Amazing vacation rental with fabulous views! We really enjoyed our 8 night stay in Pebbles. The location is absolutely amazing and we went days with only seeing a handful of other people on the beach all day. We got married on the beach right in front of the house during our stay at Pebbles. The ceremony and views were beyond perfect! Pebbles is a beautiful rental and we were pleased with the house. It had all of the amentities that we needed. We thought the Friday night fish fry was fun and really enjoyed many meals at the Buccaneer Inn. We had the nicest meal at the 1648 Restaurant our wedding night, but it was pricey. We really hope to get back to Pebbles. The owner was there during our stay and she was very helpful with all. We had an amazing, romantic stay at Pebbles and would go back! The extremely well situated property with breathtaking views was exactly as I older home perfect for those wanting a simple and relaxing time to enjoy the mostly deserted beach and incredible views.We loved it. Some hints: - The owner let us know that we could use the very short path to the beach connected to the house next door as our short path was a bit shaky for us. -The dryer is in the house next door. -The Venus Pool never materialized as shown in the photos. With official low tide times (obtained from the Haynes Library) I continued to check. The tide was never as low it must be for the pool to look like the photos.There is certainly nothing you can do about the pull of the moon! -Bring beach shoes so you can climb on the rocks and enjoy another view.-We like to cook our own food. The Island Farm had the best broccoli, papayas, fresh herbs, wine and liquor, etc ever. That along with fish from the dock in Governor's Harbor (look for the umbrella to go up around 3:30) and the nicely stocked kitchen at Pebbles completed our wonderful stay. Pebbles is situated in a perfect location. The beach right out back is gorgeous. The proximity to Governor's Harbour is also highly desirable. Tippy's is right down the road and is always great. The Buccaneer Club is close as well and offers a great place to grab breakfast. 1648 is another fantastic place, especially to catch a meal on the balcony overlooking the sunset. The home itself needs a lot of maintenance and was not in good condition for our trip. Eleuthera Vacation Rentals were very responsive and accommodating, though. They did everything they could to help address the issues with the house. They even offered us alternative housing options while we were there, but we decided the location of the property was too perfect to relocate. Overall, pick Pebbles for the location. We hope they make some much needed renovations. If that happens, it would be easy to recommend the rental to others. The owner has completed a remodel of the master bathroom which was unfortunately not completed for this guests's stay. Eleuthera is one of the larger islands of the Bahamas. It has some of the most beautiful secluded beaches to be found anywhere in the world. There are more places for quiet picnics, snorkeling, beachcombing and dining by the ocean in one of the excellent restaurants. Pebbles is on an 11 acres private estate called On the Rocks, which is located between Governor's Harbour and North Palmetto Point on the Atlantic side of the island. The best beaches are on the Atlantic side and the cooler summer breezes too! No high rise buildings, large hotels or casinos! No crowds or traffic jams! Rates are for the first 2 guests. Additional guests at Pebbles pay $200/week. Babies under 2 are free.